You must have hold a valid passport to enter Turkey. Your passport should be valid for more than six months from the date of return. If you have a Singapore or Malaysia passport, you can stay in Turkey for up to 3 months without a visa. Please keep your passport with you at all times. Do not pack it into your luggage. You are also advised to hold on to your own passport only while on the tour. You are advised to take up a comprehensive travel insurance policy to protect yourself against unforeseen circumstances, such as flight delays, loss of luggage, illness, and hospitalisation. If you are on medication, please bring enough medicine to last the whole trip. It may not be convenient to replenish your medicine while on the tour, or the medicine you require may not be available in Turkey. Do carry an extra pair of spectacles or contact lenses as well. Please be punctual while on the tour. Waiting for latecomers can be frustrating for fellow tour members and disruptive to the itinerary. Please assemble at the stipulated airline check-in row at the airport two hours before departure. Do check that you are at the correct terminal and check-in row. You are advised to punctual as latecomers may delay the tour group's departure. Please ensure that your luggage is properly locked. Write your name and contact details clearly on the stickers to be attach to your luggage. You are allowed a maximum of 20kg of check in luggage. You are allowed only one piece of hand-carry luggage weighing not more than 7kg and not exceeding a total of 115cm or 46 inches (length + breadth + height, including protrusions). To avoid security problems, please do not pack any sharp object in your hand-carry luaggage. Valuables - Valuable personal items must be registered with the owner's passport upon entering Turkey for control by the government upon exit. You are advised to keep receipts of your purchases, especially for items such as old carpets, as proof that they have been bought with legally exchanged currency. Please note that Turkey is extremely strict with the export of antiques (including imitations and fake antiques) without authorisation. The currency unit of Turkey is the Turkish Lira (TL). Coins are available in denominations of 500, 1,000, 2,500, 5,000 and 10,000. Bank notes are issued in denominations of 50,000, 1,000,000, 5,000,000, 10,000,000 and 20,000,000. 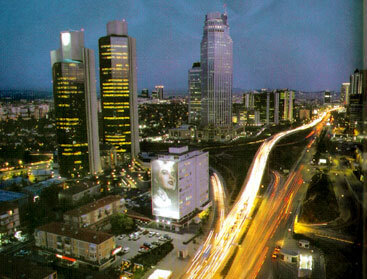 There is no limit to the amount of foreign currency that may be brought into Turkey. Singapore dollars are neither widely accepted nor easily exchangeable in Turkey. You are advised to bring US dollars or Euros and convert to Turkish liras there. You can exchange for liras when you arrive at the airport in Turkey. Major credit cards and travellers' cheques are widely accepted in hotels, shops and expensive restaurants in cities and resorts but rarely in small shops and restaurants in small villages. English, French, and German are widely spoken in hotels, restaurants, and shops in cities and resorts. 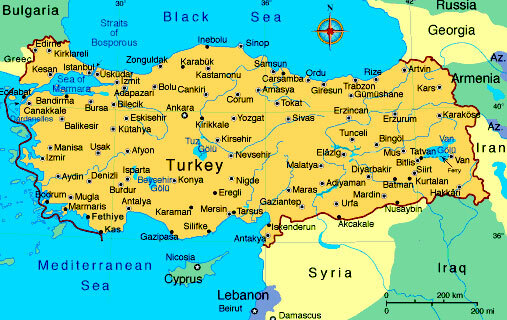 However, most locals in villages or remote areas speak only Turkish. Clothing Guide In Turkey, What clothes to wear for travel to Turkey? Please bring appropriate clothing for the various seasons. What clothes to wear during Summer in Turkey? What clothes to wear during Winter/Spring in Turkey? Warm clothing, heaven woollen coats, and gloves. Always wear comfortable walking shoes. Islam is the main religion in Turkey. You are advised to dress modestly, especially when you visit mosques and other religious sites. Women should wear headscarves when visiting mosques. Please bring your swimming gear (even in winter), as some hotels have indoor pools and heated Turkish baths, and a torchlight for underground city tours. Electricity is generally supplied at 220 volts. In a small area of Istanbul, however, it is supplied at 110 volts. Two pin round sockets are normally used in hotels. You will have to use an adapter if your electrical appliance has a square pin plug. Water Guide in Turkey, Can Drink From Tap Water in Turkey? You are advised to drink ONLY bottled or boiled water in Turkey. Tap water are not drinkable in Turkey. The International Direct Dialling (IDD) code to call Singapore from Turkey is 001 65. 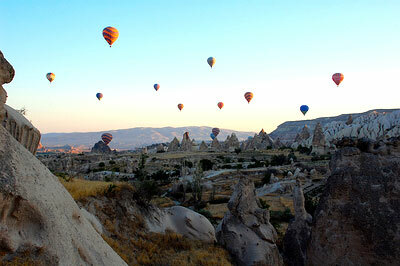 Experience a panoramic view over the beautiful landscape of Cappadocia and enjoy a Champagne after the flight. It's an experience not to be missed if you travel to Turkey. This tour will approximately costs about USD$220 per adult. A traditional Turkish therapy to relax and rejuvenate. This will costs about USD$45 per adult. Take a 1 hour cruise between Asia and Europe and view one of the most beautiful straits in the world. Explore the interesting cafe and shops at Ortakoy along the Bosphorus and shop for some local delicacies at Spice Bazaar. This tour will costs around USD$55 per adult. Turkey is an ideal destination for Congress and Incentive Travel with a wide range of accommodation and congress facilities where you can find meeting rooms equipped with the latest technology and everything necessary to meet perfectly the needs of different sorts and sizes of productive gatherings. 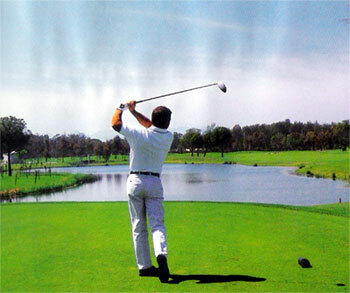 All meetings can be comfortably and pleasurably arranged in Turkey's delightful resorts. The Holiday Paradise of Turkey is a meeting place for business and pleasure where history, culture and extraordinary natural beauty complement each other. In these resorts can be found four and five star hotels, holiday villages, boutique hotels and fully equipped congress centres that all boast the highest standards plus friendly professional service and traditional Turkish hospitality. Wonderful hotels and restaurants, thoughtfully restored, offer the opportunity to try local dishes including the unique richness and authentic tastes of Turkish-Ottoman cuisine plus Mediterranean and Middle Eastern cuisines. To all of this should be added a wonderful climate, non stop entertainment and interesting excursions. Turkey has a superb geographical location where Europe meets Asia, and is surrounded by sea and the best of nature's beauty. It is an all-season meeting place that boats coastal resorts, sunshine, beautiful sandy beaches and a great variety of natural resources which have great potential for alternative tourism. It also has an outstanding cultural wealth for those travellers who want to see something more exotic or discover new cultures different from anything else in the world. Because of its proximity to Europe and the convenience of flights to Turkey with Turkish Airlines, amongst others, to large cities in the United States, Middle East and Asia, Turkey has become the country of choice for meetings, congresses, conferences, exhibitions and fairs. Our most important destinations in terms of Congress Travel are :- Ankara, Antalya, Bodrum, Cappadocia, Istanbul, Izmir, Konya, and Marmaris. Situated on the doorstep of the world Turkey offers large organisations a comprehensive professionalism plus dynamic and exciting new opportunities. You can find a list of the future events in the book "Congress Diary" and at the Turkish Ministry of Culture and Tourism website.